Andy’s Pest Control offers a long-term solution to get full carpenter ant control for your home or cottage. My approach to eliminating carpenter ants from your home includes the use of dust, residual, as well as professional grade bait. Carpenter ant treatments include all cracks, crevices, wall voids, attics, crawl spaces, window and door frames, baseboards, as well as any plumbing runs inside your home. To ensure carpenter ants do not re-infest your home, we include an exterior treatment that focuses on the perimeter of your home. We treat all decking, tree stumps, or hot spot areas where carpenter ant activity is high. All our carpenter ant treatments come with a free inspection to help the customer understand possible entry points, as well as what areas around your property could be contributing to a carpenter ant presence. All of our new carpenter ant treatments include a 1-year warranty. This gives our customers peace of mind knowing carpenter ants are no longer causing any structural damage to their home, cottage, or business. Will Carpenter ants come back? Because carpenter ants are seasonal pests, Andy’s Pest Control can offer to follow up treatments that focus on the exterior of your home or cottage to stop re-infestation and will extend your warranty 1 year. Carpenter ants play a key role in our ecosystem, particularly by aiding in the decomposition of decaying trees. They can also infest homes and other structures. They nest in moist, rotting wood, which can cause significant structural damage. 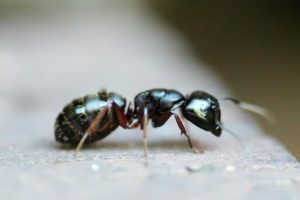 Being able to properly identify and distinguish carpenter ants from other species is an important factor in determining whether you have an infestation. I’m seeing ants with wings, what are they? When a colony reaches maturity, carpenter ants grow wings and perform a nuptial flight. They are called winged reproductives. Once carpenter ants enter into the reproductive cycle, they grow wings to start establishing satellite colonies. Once the carpenter ants establish a new nesting site, they will lose their wings and continue their life cycle. Some people call them flying ants. These “flying ants” are a sign of an established colony nearby. If you see these ants in or around your house make sure to book an appointment as soon as possible! Carpenter ants come in multiple sizes ranging from 3/8 inch to 1/2 inch. 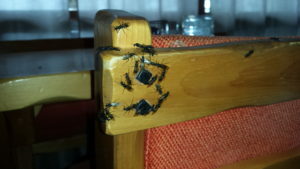 Carpenter ants are typically black in colour but can also be brownish/black. Andy’s Pest Control specializes in crawling insects in Peterborough, Kawartha Lakes, Bancroft, Haliburton, and Minden. If you are a DIY type person and just have a couple questions, it costs nothing to call.